Standing at the base of the Great Pyramid, it is hard to imagine that this monument—which remained the tallest building in the world until early in this century—was built in just under 30 years. It presides over the plateau of Giza, on the outskirts of Cairo, and is the last survivor of the Seven Wonders of the World. 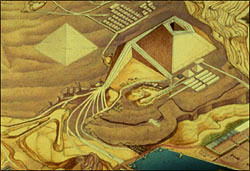 Five thousand years ago Giza, situated on the Nile's west bank, became the royal necropolis, or burial place, for Memphis, the pharaoh's capital city. Giza's three pyramids and the Sphinx were constructed in the fourth dynasty of Egypt's Old Kingdom, arguably the first great civilization on earth. Today, Giza is a suburb of rapidly growing Cairo, the largest city in Africa and the fifth largest in the world. 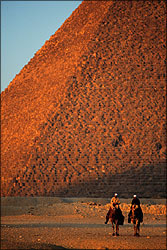 About 2,550 B.C., King Khufu, the second pharaoh of the fourth dynasty, commissioned the building of his tomb at Giza. Some Egyptologists believe it took 10 years just to build the ramp that leads from the Nile valley floor to the pyramid, and 20 years to construct the pyramid itself. On average, the over two million blocks of stone used to build Khufu's pyramid weigh 2.5 tons, and the heaviest blocks, used as the ceiling of Khufu's burial chamber, weigh in at an estimated nine tons. 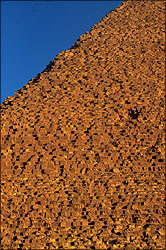 How did the ancient Egyptians move the massive stones used to build the pyramids from quarries both nearby and as far away as 500 miles? This question has long been debated, but many Egyptologists agree the stones were hauled up ramps using ropes of papyrus twine. The popular belief is that the gradually sloping ramps, built out of mud, stone, and wood were used as transportation causeways for moving the large stones to their positions up and around the four sides of the pyramids.